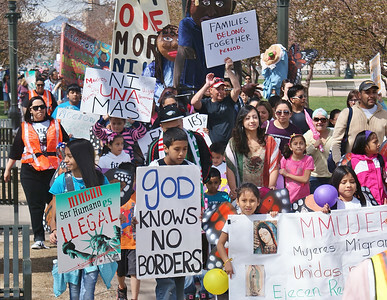 Protest march and rally against deportations and for reform of immigration laws, Denver Colorado, 4/5/14. 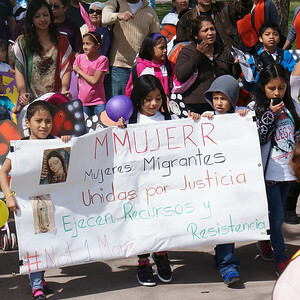 Young women chanting while marching and holding signs at protest against deportations. Young woman at head of march shouts, many marchers with signs behind her. 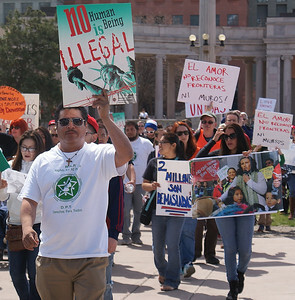 Hispanic man holds sign above head, others behind him signs, marching at protest against deportations. 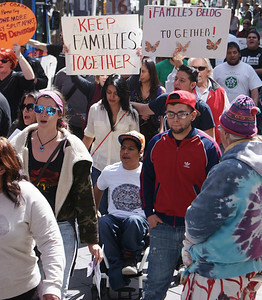 Young hispanic man in wheelchair marches with other at protest for immigration reform. Large group of marchers at immigration reform protest. 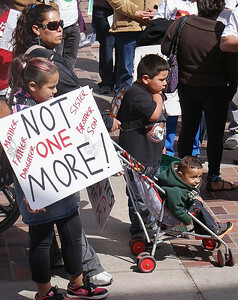 Many marchers, including young children, carrying signs. 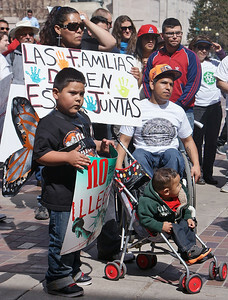 Hispanic woman and children holding signs for immigration reform, young child in stroller, young man in wheelchair with them. Marchers holding signs and shouting, at protest against deportations. 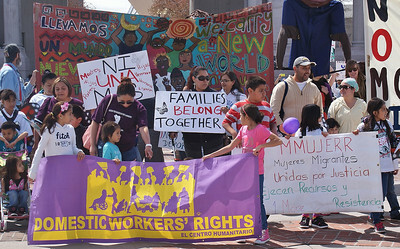 Large group of people at head of immigration reform march, many holding signs, children hoding "Domestic Workers Rights" banner. 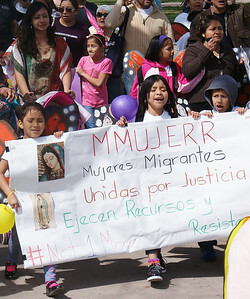 Hispanic children carrying banner, many adults behind them with signs, at immigration reform march. 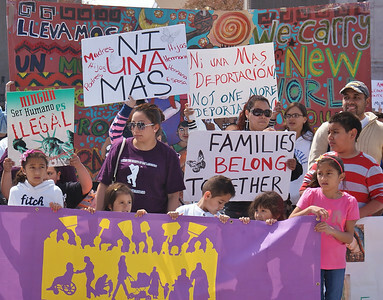 Young hispanic children shout while marching with banner in Spanish, at protest against deportations. 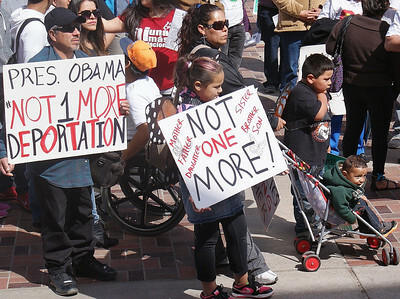 Young hispanic children marching with banner in Spanish, at protest against deportations. 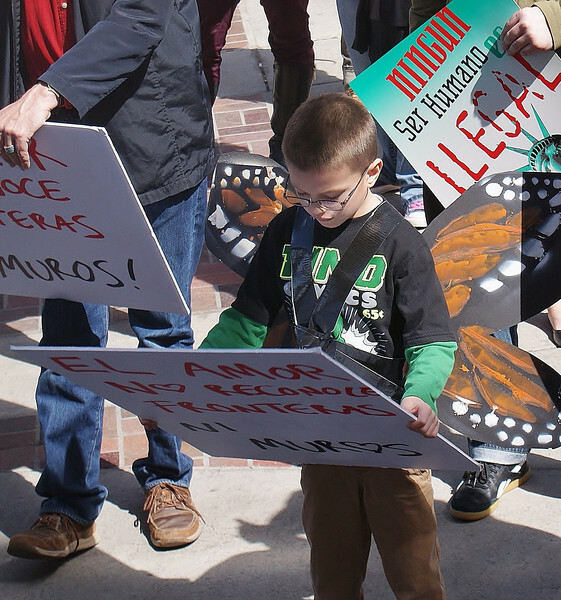 Young boy looks down at sign he is holding at immigration reform protest, adults on both sides of him. Young boy looks down at sign he is holding at immigration reform protest. 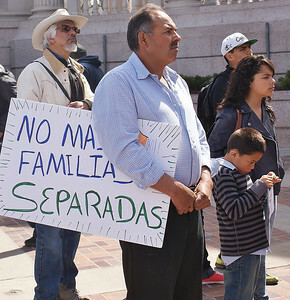 Hispanic man holding sign in Spanish, flanked by young boy and girl, and man in cowboy hat. 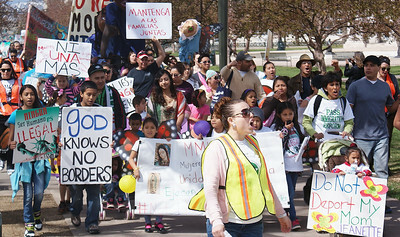 Hispanic mother and three children, one in stroller, one holding sign at immigration reform rally. 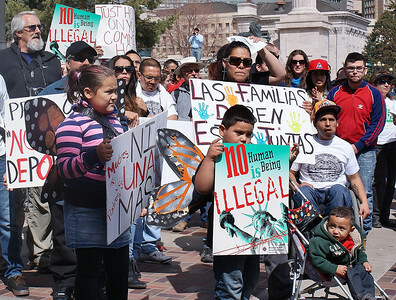 Hispanic mother and three children, one in stroller, one holding sign at immigration reform rally, man with sign behind them. 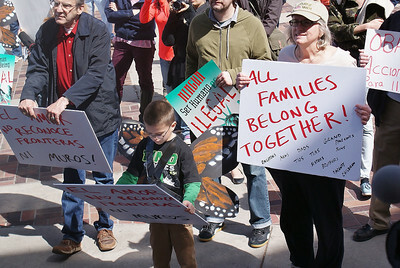 Hispanic mother and three children, one in stroller, one holding sign at immigration reform rally, man with sign in front of them. 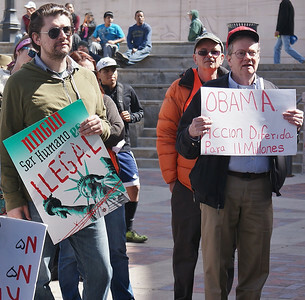 Man with sign calling on President Obama to end deportations. 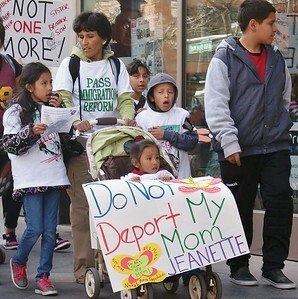 Hispanic mother with young children, one in stroller carrying sign, march in protest against deportations. 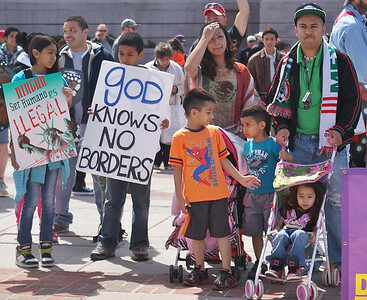 Hispanic parents with young children, one in stroller, others holding signs at immigration reform march. 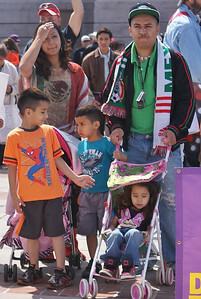 Hispanic parents with young children, one in stroller, at immigration reform march. 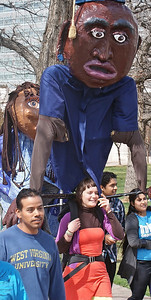 Giant puppets, one depicting student in cap and gown, protest marchers in foreground. 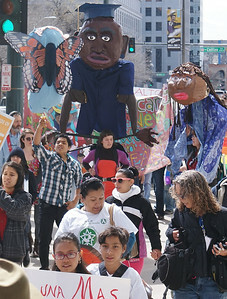 Young woman carrying giant puppet in anti-deportation march. 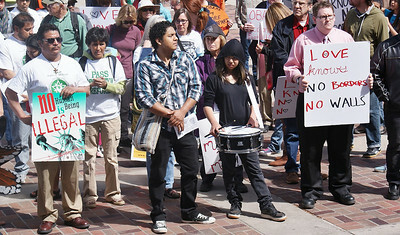 Young hispanic girl with drum, flanked by adults with immigration reform signs. 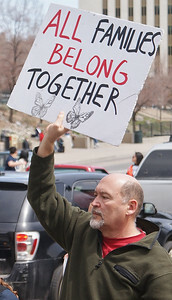 Man holds up sign about families at protest against deportations. 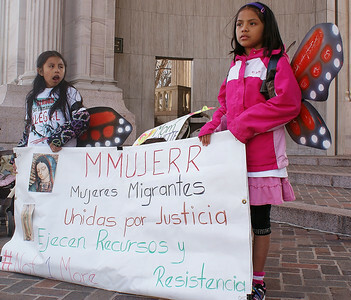 Two young hispanic girls wearing butterfly wings, holding sign in Spanish, opposing deportations. 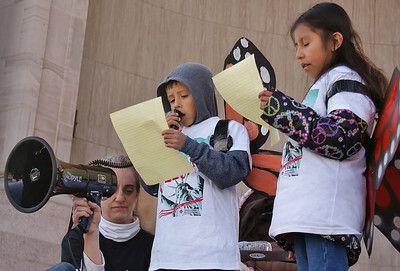 Young hispanic boy speaks at immigration reform rally, woman holding bullhorn crouches beside him, young girl next to him. 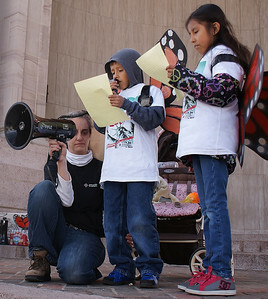 Young hispanic boy speaking at immigration reform rally, woman beside him holding bullhorn, young girl beside him. 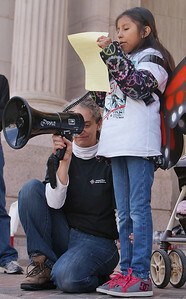 Young hispanic girl speaks at immigration reform rally, woman crouching beside her holding bullhorn. 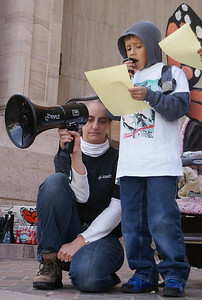 Young hispanic boy speaks at immigration reform rally, woman crouching beside him holding bullhorn. 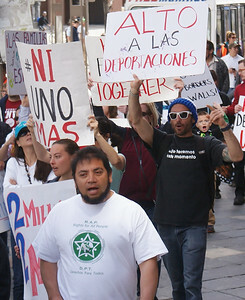 Two men holding signs for immigration reform at rally. 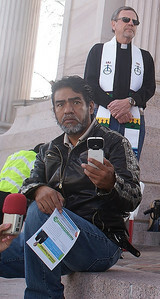 Hispanic man sitting on step holding cell phone, clergyman standing behind him. 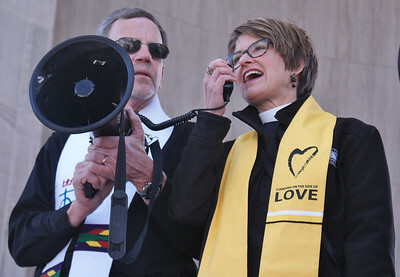 Woman member of clergy, speaking through bullhorn being held by clergyman next to her. 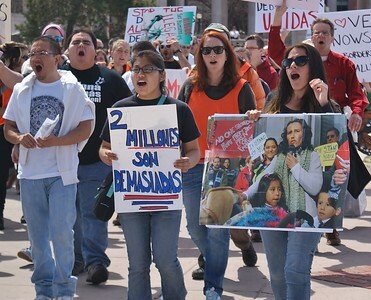 Hispanic woman speaks through bullhorn. 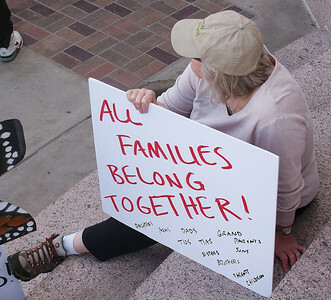 Woman sitting on step, holding sign opposing deportations. Woman holding round orange sign opposing deportations. Woman holding sign above head at immigration reform rally. Sign in Spanish.